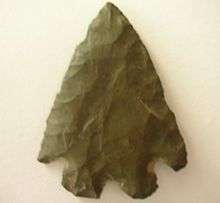 In archaeological terms, a projectile point is an object that was hafted to a projectile, such as a spear, dart, or arrow, or perhaps used as a knife. 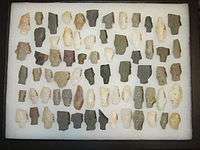 Stone tools, including projectile points, can survive for long periods, were often lost or discarded, and are relatively plentiful, providing useful clues to the human past, including prehistoric trade. Scientific techniques exist to track the specific kinds of rock or minerals that used to make stone tools in various regions back to their original sources. 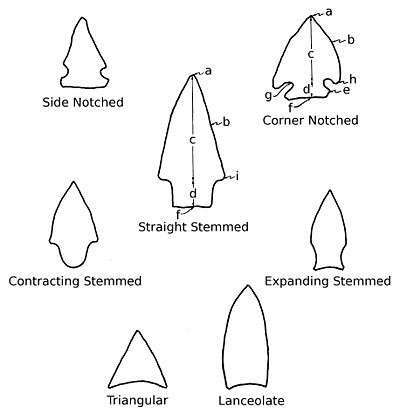 Occasionally, projectile points made of worked bone or ivory are found at archaeological sites. In regions where metallurgy had emerged, projectile points were made from copper, bronze, or iron. In North America, some late prehistoric points were fashioned from copper that was mined in the Lake Superior region and elsewhere. 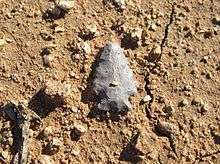 ↑ "Clovis People Weren't First in Americas, Texas Spear Points Suggest". The New York Times. 24 March 2011.